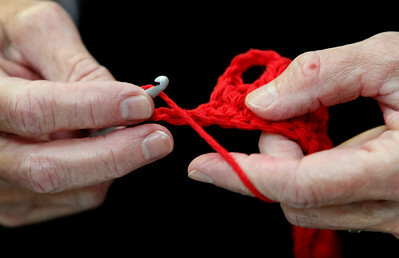 Matthew Apgar - mapgar@shawmedia.com Maria Verma of Woodstock, left, learns crochet from Alexis Redmond of Crystal Lake at Fabric, Fiber, and Finds on Wednesday, Oct. 07, 2015 in Crystal Lake. The store will be putting on a 24-hour marathon using sewing, knitting, crocheting, and more to achieve a goal of 200 handmade hats to donate to two area chemotherapy clinics. 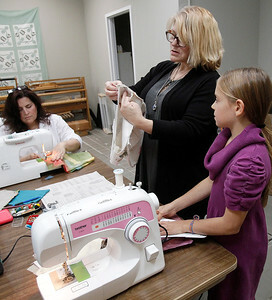 Matthew Apgar - mapgar@shawmedia.com Addie Follett of Lakewood, 11, works on sewing a purse with Louise Steinbach, right, at Fabric, Fiber, and Finds on Wednesday, Oct. 07, 2015 in Crystal Lake. The store will be putting on a 24-hour marathon using sewing, knitting, crocheting, and more to achieve a goal of 200 handmade hats to donate to two area chemotherapy clinics. Matthew Apgar - mapgar@shawmedia.com Maria Verma of Woodstock learns crochet from Alexis Redmond of Crystal Lake, not pictured, at Fabric, Fiber, and Finds on Wednesday, Oct. 07, 2015 in Crystal Lake. The store will be putting on a 24-hour marathon using sewing, knitting, crocheting, and more to achieve a goal of 200 handmade hats to donate to two area chemotherapy clinics. Matthew Apgar - mapgar@shawmedia.com Maria Verma of Woodstock browses the yarns for sale at Fabric, Fiber, and Finds on Wednesday, Oct. 07, 2015 in Crystal Lake. The store will be putting on a 24-hour marathon using sewing, knitting, crocheting, and more to achieve a goal of 200 handmade hats to donate to two area chemotherapy clinics. 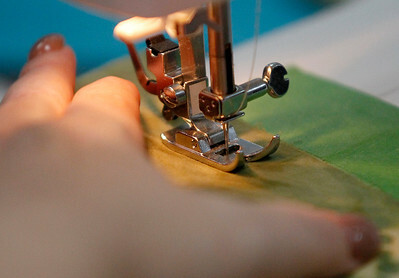 Matthew Apgar - mapgar@shawmedia.com Carmen Pappas of Woodstock works on a sewing machine at Fabric, Fiber, and Finds on Wednesday, Oct. 07, 2015 in Crystal Lake. The store will be putting on a 24-hour marathon using sewing, knitting, crocheting, and more to achieve a goal of 200 handmade hats to donate to two area chemotherapy clinics. Matthew Apgar - mapgar@shawmedia.com Louise Steinbach, center, helps Addie Follett of Lakewood, 22, with sewing her purse as Carmen Pappas of Woodstock, back, works on sewing a pair of pants at Fabric, Fiber, and Finds on Wednesday, Oct. 07, 2015 in Crystal Lake. The store will be putting on a 24-hour marathon using sewing, knitting, crocheting, and more to achieve a goal of 200 handmade hats to donate to two area chemotherapy clinics. 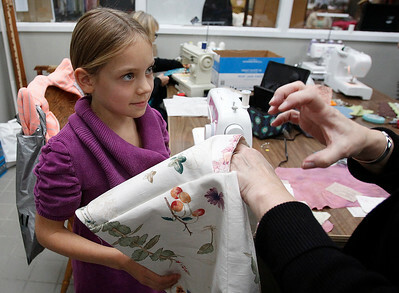 Addie Follett of Lakewood, 11, works on sewing a purse with Louise Steinbach, right, at Fabric, Fiber, and Finds on Wednesday, Oct. 07, 2015 in Crystal Lake. The store will be putting on a 24-hour marathon using sewing, knitting, crocheting, and more to achieve a goal of 200 handmade hats to donate to two area chemotherapy clinics.